Hey… it’s a doll just like me! Lottie Dolls empower children to be themselves, embrace individuality, enjoy their childhood, and have meaningful and inspirational adventures. Unlike other dolls, Lottie and Finn have child-shaped bodies based on the realistic physical proportions of 9-year-old girls and boys. They’re age-appropriate. Lottie doesn’t wear makeup or jewellery, and there’s no Lottie Corvette. Lottie loves adventure and the outdoors, and using her imagination. 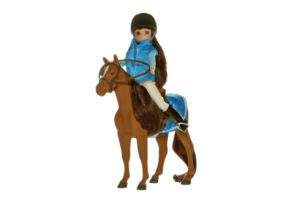 Lottie Dolls have a diverse range of skin, hair and eye colors. Some wear glasses, and all of them literally stand on their own two feet – without falling over! Perhaps most important… children can relate to them – physically and socially – encouraging enriching developmental and educational experiences, and promoting intellectual growth and exploration. As role models, Lottie Dolls represent the realistic and positive facets of childhood, and they’ve won awards from parents and childhood development experts around the world.